LOVELAND, CO – During the 1920s, Loveland boasted the largest cherry orchard to the west of the Mississippi River and was famous for producing over $1 Million in cherries every year. The Loveland Museum will commemorate Loveland’s longstanding connection with the cherry industry with the annual Cherry Pie Celebration on Saturday, July 16 from 5:00 – 8:00 pm. The free event will take place in Peters Park next to the Museum and includes live music, vendor booths, pie/ice cream/drinks for sale, family-friendly activities, and the Art of the Tart Cherry Pie Contest. A free pre-event lecture discussing the history of the cherry industry in Loveland will take place at the Museum on Thursday, July 14 from 5:30 – 7:00 pm. 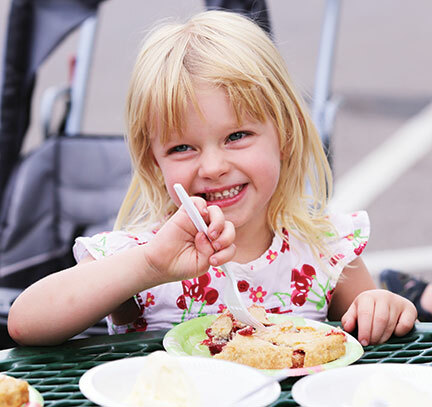 Admission to the Cherry Pie Celebration on Saturday, July 16 is free to individuals of all ages, and single serving portions of cherry pie, ice cream, coffee, and lemonade, are available for purchase. Visitors will enjoy live music, vendor booths, children’s activities, and historical displays. The evening’s entertainment line-up includes Rusty 44 from 5:00 – 6:15 pm and the After the Fire from 6:45 – 8:00 pm. The annual Art of the Tart Cherry Pie Contest will include competitions in two age categories: adults and students under the age of 18. All entries must be in pie form (no crumbles, cobblers, crisps, etc.) and dropped off at the contest table by 4:30 pm. Category winners will be announced at 7:00 pm. Pies will be judged on crust, filling, texture, taste, and overall appearance. Commercially baked pies are not allowed, and all pies must be prepared within 24 hours of the 4:30 pm deadline. Late entries will not be accepted. Align Chiropractic, Awesome Smilers, Back to Health Chiropractic, Boys and Girls Club of Larimer County, City of Loveland Open Lands Division, City of Loveland Water and Power, Larimer County Extension- 4H, Lemon Poppy Inc., Living Well Nutrition, Loveland Classical Schools, Loveland Downtown Partnership, Loveland Public Library, Lutheran Family Services, New York Life, RJ’s Amazing Entertainment, Salvation Army, Sports Clips Haircuts, Stowers Orthodontics, Thompson Valley Art League, Tutoring Club of Fort Collins, United for Thompson, Visit Loveland, and Voices Carry Child Advocacy Center. Other contributions to the event made by: A-Basin, Align Chiropractic, Arte Pizzeria, Awesome Smilers, Back to Health Chiropractic, Kitchen Alley, Lemon Poppy Inc., Living Well Nutrition, New York Life, Sports Clips Haircuts, Stowers Orthodontics, Town Square Media, and Visit Loveland. A pre-event presentation about the history of Colorado’s cherry industry will be presented on Thursday, July 14 from 5:30 – 7:00 pm in the Foote Gallery Auditorium at the Museum. Sharon Danhauer, a longtime member of the Loveland Historical Society, will share images and information about this key movement in Loveland’s economic history. During the 1920s, the Loveland area was known as the region best adapted to raising cherries in Colorado. There were 10,000 acres dedicated to the crop, and trees covered areas now occupied by Orchards Shopping Center and Cherry Hills Estates. In addition to housing the largest cherry orchard west of the Mississippi, Loveland boasted three commercial canning companies and was operating cherry processing factories during the height of the industry. These companies are Kuner-Empson, Loveland Canning, and Cherry Products Corporation. The cherry cider industry flourished in Loveland as well. Mrs. A.V. Benson and Neville’s fruit ciders were known throughout the United States for producing delicious fruit cider. Thirsty tourists in Model Ts helped launch what once was one of Northern Colorado’s most flourishing roadside industries. The Loveland Museum is an accredited art and history museum that was founded in 1937 by local author, collector, curator, and mountain guide Harold Dunning. Dunning began collecting pioneer artifacts and stories as early as 1919, and today, the Loveland Museum is home to a variety of history exhibits, hosts world-class art exhibitions, and provides family events; adult and youth classes; lectures; poetry readings; and other programming opportunities for the Loveland community and visitors from around the world.